Every Sai Devotee wishes to serve Baba in his own special and peculiar way. They all bear a special love for Baba and believe me that Baba gives them such special characteristic, art, ability or whatever name we call, to show his/her devotion. No specific Sadhana is necessary for Baba's Bhakti. Any deed out of love and devotion is readily accepted by Baba. Today I have uploaded a power point presentation created by a ten year old young devotee of Baba. Her mother has sent me this presentation which clearly reflects a young devotee's love and devotion towards Baba. PLEASE FIND ATTACHED THE POWER POINT PRESENTATION WHICH MY DAUGHTER HAD MADE FOR 31ST DECEMBER. I ONCE AGAIN WITH DEEP HEART THANK YOU FOR MAKING ME A MEMBER OF THIS GROUP AND ALSO ALWAYS REMEMBER ME AS YOUR SAI SISTER POOJA MAZUMDAR IN EDMONTON, ANYHTING I CAN DO FROM HERE FOR BABAJI, PLEASE LET ME KNOW. PLEASE GIVE ME THE OPPORTUNITY TO BE PART OF SAIBABA DEVOTEES. MY DAUGHTER HAS MADE A POWER POINT PRESENTATION FOR OUR SAI TEMPLE WITH PHOTOS OF BABAJI, I WILL SEND YOU THE LINK SO THAT YOU CAN SHARE WITH OTHER SAI DEVOTEES, SHE IS 10 YEARS OLD AND SHE IS BABA'S GIRL. After seeing the presentation, I was surprised how such a young kid can do marvelous job. She has collected about 75 pictures from this blog and other internet sources and placed them at one place for us. The sequence of the pictures signifies her worth praising presence of mind and intelligence. I loved it a lot and hope you will also like it. I pray Baba to take care of this young devotee and shower His choicest blessings on her. Baba loved all His Bhaktas dearly, but had special love for kids. Here is short experience of young Sai Devotee Suhas. It was in the year 1981 when he was of four and half years. Baba saved his life and gave him Sakshat Darshan. Suhas's father Shri Jayvant Pawar was serving in Thane District Council. On January 24, 1981, he got slight fever and his condition worsened as time passed by. He was hospitalised and treated till February 13, 1981. He was alright all day, but at night he had difficulty in breathing and was unable to sleep. Immediately he used to get up in his bed and passed many sleepless nights. Due to this, his condition was not improving and was getting weaker day by day. His father could not see his bad condition and mentally begged Baba to take care of his child. All sorts of medicines were tried but there was no improvement in his condition. Medicines did not affect the illness at all. As there was no improvement in child's condition, the father decided to consult child specialist Dr. Merchant. Dr. Merchant did various tests, but could not conclude any specific cause for child's ailment. He refused to admit him for further examination. Suhas's father again tried to approach Dr. Merchant through his doctor friend Dr. Jadav. When they all were present, Suhas again had difficulty in breathing. He tried to breathe with full force. Thus Dr. Merchant was convinced that there was some problem with young patient and Suhas was at once shifted to ICU. Dr. Merchant advised a special test called Bronchoscopy. The night before this test, Suhas's parents was outside ICU. Dr. Jadav was in seated beside Suhas's bed on a chair. Suddenly Suhas said, "Doctor uncle, you please stand up from your chair and look, Sai Baba has come to meet me. Let Him sit on this chair. He have to behave respectfully in His presence". Dr. Jadav answered, "Son what are you saying? I cannot see Sai Baba nearby", thinking Suhas to be speaking unnecessarily due to his illness. Suhas answered, "Doctor uncle, Sai Baba is here. He is standing beside you. I can see Him clearly. Why dont you empty yor seat for Baba?" Dr. Jadav was surprised and could not believe his ears. 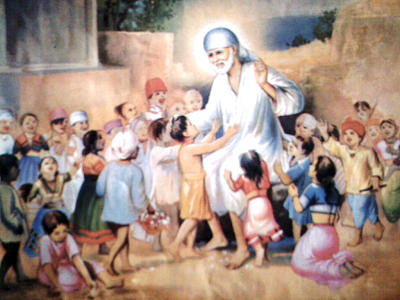 He thought how can Sai Baba give Darshan to a small kid of just four and half years old. Dr. Jadhav was under wrong impression that being a kid Suhas must have heard about Sai Baba from his elders or he must have seen His picture somewhere, but failed to understand that Sai Baba had come in reality to save His loving son Suhas. After Baba's darshan, Suhas's condition started improving, medicines started affecting and a ray of new hope was seen. Next day Bronshoscopy test was conducted and the exact cause of Suhas's ailment was detected. He was operated for this. After operation Suhas became normal as other kids of his age and could enjoy each moment of his life. All this happened only with Baba's grace and blessings is the strong belief of Suhas's parents. baba mujhe hamesa apne charno me rakhana. jaise aap samay-samay me mera marg-darshan karte rahte.he mughe hamesa esi tarah se marg dikhate rahiyega. aur ek baar mujhe sirdi aana hai.please baba apne darshan jaldi dena.jab tak aap ki kripa mujhpe nahi hogi mai aap ke darshan nahi kar pauga. he baba apni kripa mujhpe hamesa rakhiyega. Saibaba of shirdi is spread every where and he is protecting all who seeks his help. He is the god for all, He only tests our patient and trust in him before he gives any thing to us. Just have trust in him and have patients and do not ask any thing to any one what every u needs.You will get all what ever you want from saibaba of shirdi..
Akhilanda Koti Brahmanda Nayaka Raja di Raja Yogi Raja Parabrahama Sri Satchidananda Samarda Sadguru Sainath Maharaj ki Jai.